eBay is a multinational e-commerce Corporation, facilitating online consumer-to-consumer and business-to-consumer sales. eBay is one of the largest online marketplaces in the world. It’s a leading website where users can buy and sell their products globally. The one can open up the business’s potential by expanding the product presence to largest online marketplaces like eBay. 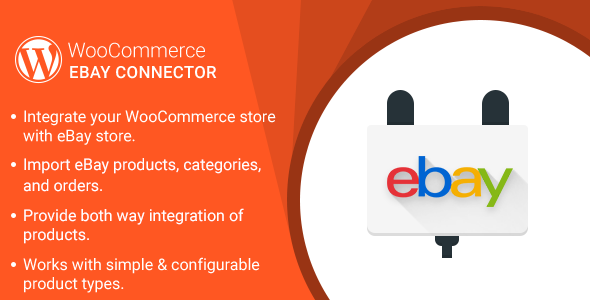 Webkul’s WooCommerce eBay Connector plugin will integrate your WooCommerce store with eBay store because managing them separately is enough to sap all of the time and to drain profits. This plugin provides both ways integration that means admin can sync the products from WooCommerce store to eBay and vice versa. "Initial release v 1.0.0" "Current release v 2.0.0"
Update : Categories creation process raw data for categories deletion is introduced. Fixed : Database prepare removed, used for an unwanted purpose. Fixed : Product, Order, Categories API's updated for better performance. Fixed : Product description from eBay is filtered for some unwanted scripts and styles form eBay.